I thought so and started to write some Haskell code that would solve the puzzles. And then I got stuck. I could solve the most trivial puzzles quickly, but the iterative approach I had implemented was far too inefficient to solve the more complex ones. All I had been doing was generating the rows that could fit and then filtering the Cartesian product of them for valid grids. That worked on 8x8 grids, but beyond that things became too slow. The "double digit rule" — if you see _11_ or _00_, you can replace the blanks with the other digit, so _11_ becomes 0110. This got me to being able to solve my test puzzle from the book with my original Cartesian product approach. However, I now had a test case from binarypuzzle.com which was not feasible to solve. I would have to check around 566558720000 different grids for validity. Generating the grids was fast but checking was slow. 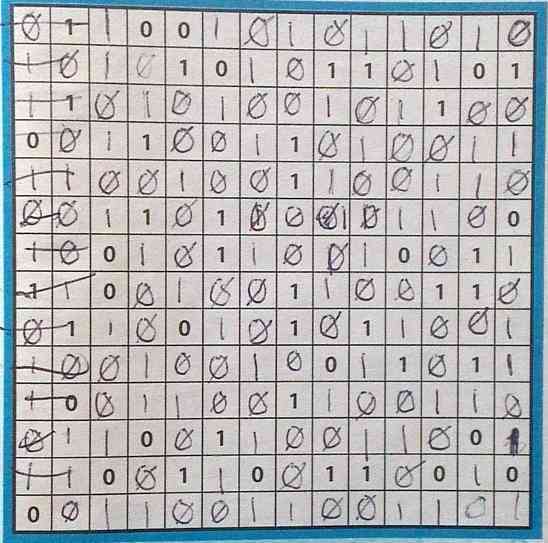 Fortunately, I had come across Richard Bird’s sudoku solver in Pearls of Functional Algorithm Design and was able to use a similar trimming approach to reducing the problem space. Given a grid, you first apply the simple rules above. Then you generate a "matrix", which is a list in which each element is the rows that could possibly be answers for that grid. If there is only one entry per element, then you have a candidate correct answer. Otherwise take the shortest element with more than one entry and create matrices for each entry, filter for matrices that are filled with single entry elements and generate valid grids and return the first of those. Once you have that the problem is solved. I went from being unable to solve the puzzle to being able to solve in a few seconds. I believe that further improvements are possible — parallelizing to take advantage of multicore architectures or implementing more complex rules for example — and will perhaps work on them "at some point". For now though, my Binary Puzzle solver code is on GitHub and I welcome feedback, criticism or contributions.